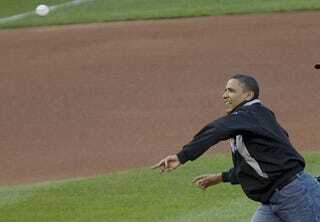 As you know, our commander-in-chief took the mound last night and did an excellent impression of a man trying to throw a party balloon. I asked some experts to evaluate Obama's mechanics and explain just what needed to be fixed. It's not good but he said he never played ball as a kid. He looks awkward, but gets a good stride. His elbow's a bit low and his follow through is very short. You know what it looks like? It's like he's trying to throw the ball in, Christian Laettner-style, from the baseline down to someone. Even in throwing a baseball, he's playing basketball. He's playing to the camera. He kept face forward pretty much the entire time. Maybe that's nerves — even that guy probably gets nervous doing something so unnatural for him — and doesn't get much leg. He was very upright so I'd tell him to get a little bend and push with his knees as he comes through. With a bit more velocity, it would be less of a lollipop curve. He did everything he needed to do to get the baseball there. When he got the arm up and drove it forward, I thought the pitching forearm was pretty close to vertical. If, when you release the ball, your forearm is vertical, that's doing a really good job. Most baseball players — like Dontrelle Willis — their forearms are horizontal. It makes it difficult to throw anything in the strike zone. Given the circumstances, and whatever protective gear he was wearing and everything else, I think he did just fine. He doesn't use the arm as powerfully as he could. He's very guarded. He was very tight with his shoulders and elbow action. What I'd teach him to do is lengthen out the arm, lengthen out his backswing. I've seen him shoot jump shots. He has an excellent shooting stroke. It's not all that much different throwing a baseball. It takes training, though, and I'd like him to spend as much time as he can on fixing the economy. His balance and posture were very good. His lift and thrust — in other words, getting his body going — were very good, considering the fact that he had street clothes on and was wearing a coat. His stride and momentum were a little short, but serviceable. His opposite-and-equal was barely adequate; his arms should look the same on both sides of his body going into his foot stride, but he was a little soft with his right arm, and a little bit of what we call a short-armer with his left arm. His actual throwing motion wasn't too bad. It's serviceable. Into the release point, it was very good. His release point was a little short, and because of that, the ball didn't quite get the whole way. 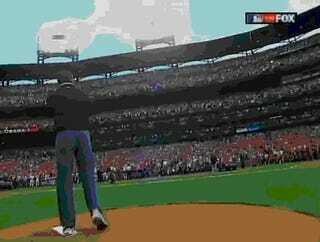 If he was a coach throwing batting practice, it would've been great. I'd tell him to come faster, go forward to the target faster, stride farther, and extend both the throwing arm and the gloveside arm from inside of 90 degrees to outside of 90 degrees. His problem was that he didn't take advantage of his levers. Basically, it was just a step and throw. If I was one-on-one with him, I'd ask him if he was just trying to survive the throw rather than make the throw. If I was certain he was in shape, I'd have him show a bit more number as he comes down the hill. I'd like him to get a bit more violent.